This bulk pack contains about 1760 individually wrapped hard fruit flavored mini candies for offering and sharing. 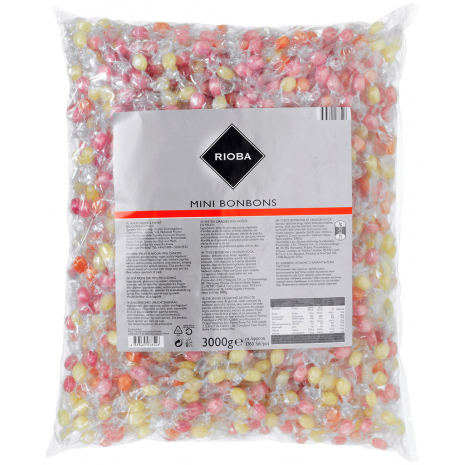 These tiny hard caramels come in different flavors and are only available in the large 6.61 lbs bulk pack. A great product especially for restaurant, café and bar owners as well as hoteliers. Ideal for offering and sharing with customers and guests. Get the special attention you deserve. 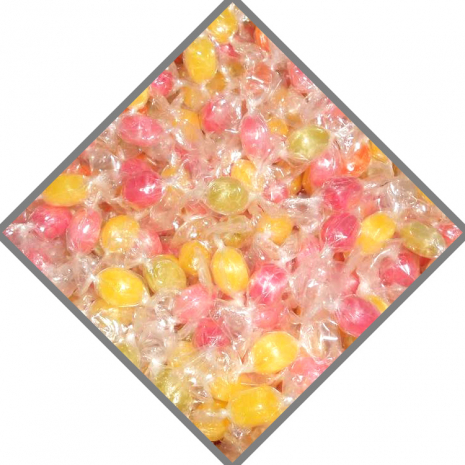 The bulk pack contains about 1760 individually wrapped hard candy minis with fruity flavor. Please note: This item is NOT a stock item. Please allow for an additional 2-4 business days processing time so we can place a fresh order with our suppliers. Thank you for understanding. 3000g / 6.61 lbs NET. WT. Sugar, glucose syrup, acidity regulator: citric acid, natural flavors, salt, carrot juice from concentrate, spinach- and stinging nettle extract, turmeric root extract, color: paprika extract. May contain traces of soy and dairy products. Zucker, Glukosesirup, Säureregulator: Citronensäure, Aromen, Salz, Karottensaftkonzentrat, Spinat- und Brennnesselextrakt, Kurkumawurzelextrakt, Farbstoff: Paprikaextrakt.